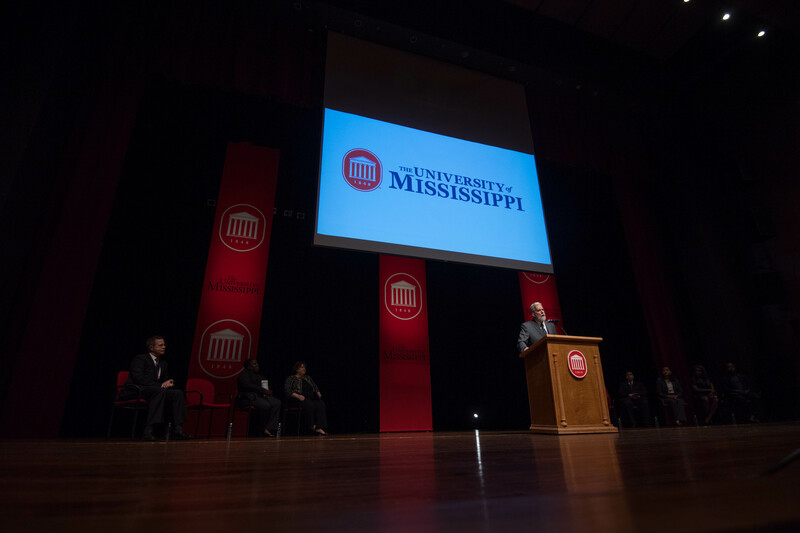 The University of Mississippi held a ceremony March 2, 2018 to unveil six history and context plaques, which contain wording recommended by the Chancellor’s Advisory Committee on History and Context following months of study and feedback from hundreds of stakeholders. The ceremony took place at the Gertrude C. Ford Center for the Performing Arts. Plaques were unveiled for Barnard Observatory, Lamar Hall, Longstreet Hall and George Hall; another recognizing the university’s enslaved laborers in the construction of Barnard Observatory, the Old Chapel (now Croft), the Lyceum and the Hilgard Cut; and a plaque for the stained-glass Tiffany windows in Ventress Hall recognizing the University Greys, a Civil War company of primarily UM students that suffered 100 percent casualties – killed, wounded or captured. A reception, which was held in the rehearsal studio following the ceremony. Shuttles from the Ford Center to the plaque sites were available after the ceremony. Student docents and a member of the CACHC greeted visitors at each plaque. Please make plans to attend the event on March 2, 2018, on the Oxford campus for the unveiling of contextualization plaques recommended by the CACHC for Barnard Observatory, Lamar Hall, Longstreet Hall, George Hall, and a plaque recognizing the university’s enslaved laborers in the construction of Barnard Observatory, the Old Chapel (now Croft), the Lyceum, and Hilgard Cut. Additionally, after receiving positive public input, Chancellor Vitter has accepted the further recommendation from the CACHC to add a contextualization plaque of the stained-glass Tiffany windows in Ventress Hall recognizing the University Greys. This plaque will be included in the ceremony along with the five plaques listed above. Be sure to visit context.olemiss.edu/implementation/ for more information about the implementation status of the plaques. This site includes renderings of the plaques as well as maps and photos of where they will be placed. Click here to read the IHL Board’s resolution. Click here to view final report submitted by the members of the Chancellor’s Advisory Committee on History and Context. Community engagement and public input is an integral part of the CACHC. One of our steps to engage the UM community in Phase II is through an online form on the context.OleMiss.edu website. We encourage you to use this form to submit your ideas about important facts or other information to be considered in the design and/or format of content. All ideas will be considered by the CACHC members. Ideas should be submitted no later than March 31, 2017. As we continue our work, we encourage you to check the context.OleMiss.edu website. In addition, you can contact us via email at context@OleMiss.edu. We urge you to stay engaged in this process. On August 16, 2016, the Chancellor’s Advisory Committee on History and Context held its first meeting and received its charge from Chancellor Vitter. We encourage you to read the chancellor’s charging remarks in full which provide a summary of contextualization efforts on campus and the process of determining the composition of the CACHC as well as the specifics of the charge including a timeline. Community engagement and public input is an integral part of the CACHC. We are now focused on the first part of our charge to recommend which additional physical sites (monuments, buildings, street names) on the Oxford campus (beyond those already completed) should be contextualized, so as to explain the environment in which they were created or named. One of our first steps to engage the UM community is the establishment of an input mechanism on the context.OleMiss.edu website. We encourage you to use this form to submit your ideas about which campus sites should be recommended for contextualization. All ideas will be considered by the CACHC members (see bios here) when determining the recommendation list to be submitted to the chancellor. Ideas should be submitted no later than September 9, 2016. Once the recommendations have been reviewed by the chancellor’s office later this semester and the list of sites is finalized, the committee will then proceed with the second part of our charge of designing content and format to contextualize the designated sites. At that point, we will inform you of the mechanisms we intend to employ to garner your input on this part of our charge. As we continue our work, we intend to keep you updated on the context.OleMiss.edu website. In addition, you can contact us via email at context@OleMiss.edu. We urge you to stay engaged in this process. What do you think is important criteria for the expanded committee members? What would you consider is optimum size for the committee? What other groups should I ask for advice? What are other ways to engage the community? The response in these meetings was overwhelmingly positive and supportive. Key themes emerged from these conversations that will shape and guide the CACHC composition, which is the key factor in its ability to accomplish its charge. The committee will be asked to keep the community engaged through various mechanisms such as public forums, listening sessions, and online feedback forms. As projects are scheduled or under consideration they will be posted so the CACHC can hear input from the community. The community has suggested that the committee have expertise in areas such as history, sociology, English, law, and race relations, that it represent broad perspectives and understand deeply the UM community and culture, that it is to be unifying while addressing potentially divisive issues, and that it operate in an inclusive, respectful, civil, candid, and transparent manner that honors the UM Creed. The committee will consider the addition of ad hoc expertise as needed on a project-by-project basis, and will keep the community informed of the status of projects under consideration. It is important to acknowledge that no single committee member will possess all the suggested expertise, characteristics, and qualifications that are considered important; rather, it is the committee as a composite that will possess these qualities and ensure that all input is considered.